Some entertainment blogs are reporting that filming for The Hunger Games is headed to Charlotte earlier than originally scheduled. The Lionsgate movie is based on the best-selling, science fiction novel about a post-apocalyptic world in the country of Panem, where North America once existed. These games are held there, during which one boy and one girl from each district fight to the death. Filming for the movie has been taking place for the past month or so in small towns in North Carolina (such as Shelby), in Asheville, and in the mountains. Charlotte and Concord reportedly are going to be used for the Capitol scenes--Capitol is the city in Panem that's home to the totalitarian government--and filming here was previously announced to "take place on or around Aug. 1-3, 9-12, 15 and 22." It now might begin sooner, so if you see big tractor trailers rolling up in the next few days, this could be why. 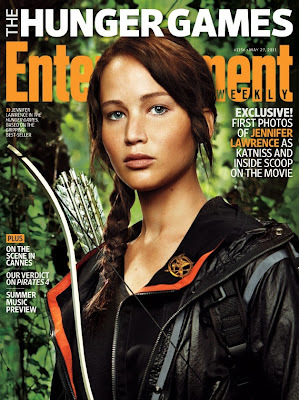 Jennifer Lawrence appeared on the cover of the May 27 issue of Entertainment Weekly for its exclusive, first-look coverage of The Hunger Games. According to IMDB, actors cast in the movie include: Jennifer Lawrence, Josh Hutcherson, Elizabeth Banks, Liam Hemsworth, Woody Harrelson, Donald Sutherland, Lenny Kravitz, and more. It will be interesting to see which of the big stars come to Charlotte for the scenes. Good Luck Stephen and Ayesha!